Shaft - Stiff flex JZ steel shafts, for golfers with faster swing speeds. Condition - Very Good. LEFT HAND. The extreme perimeter weighting of the ZING provides a very high level of forgiveness, whilst the rounded sole provides a great level of playability. Made from softer feeling beryllium copper. Kept in very good condition. The PING ZING irons where originally introduced in 1992. The ZING Irons have a thicker top line and enhanced perimeter weighting to make them very forgiving irons. The ZING irons are available with stainless steel heads or the softer feeling beryllium copper. The PING ZING2 Irons feature similar extreme perimeter weighting as the ZING irons, however they have a cleaner top line for improved appearance at address. Introduced in 1994 PING ZING2 irons have remained one of PING's most forgiving irons, highly popular with golfers around the world. PING ZING2 irons are available in stainless steel only. "Ping zing's arrived today and I'm very pleased with them and your excellent service. Thanks very much." "ZING are great irons, legendary. I've tried newer models but just keep coming back to my ZING's. For me the weighting system is perfect." "I regretted selling my ZING2 irons a few years back, I've never found a set of clubs so forgiving, so thank you usedping.co.uk, the set you sold to me where in fantastic condition and I'm playing well again with them"
"My husband was extremely pleased with his present and if ever he wants anything else we will certainly shop with you again. Once again many thanks." "I'm highly delighted with the clubs, service and communication, and won't hesitate to recommend you to anyone looking for quality Ping equipment." 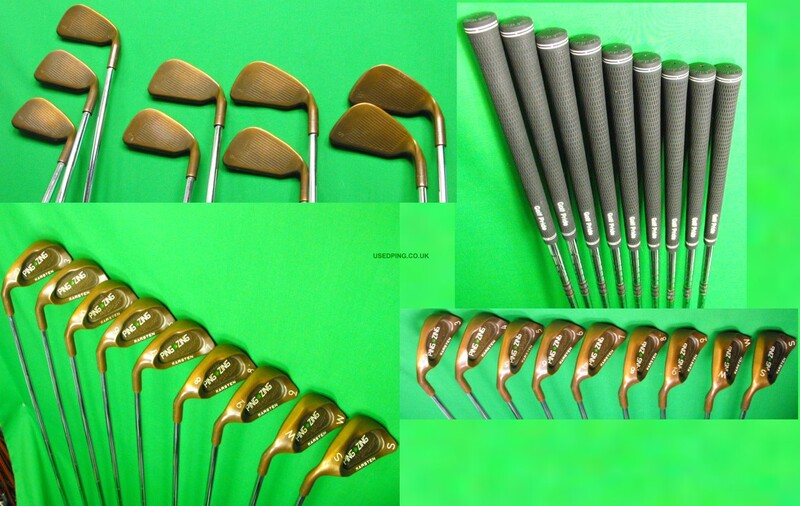 "Just a quick note to say the clubs have arrived and they are in fantastic condition. Thanks very much for your help and quick dispatch; I'm very grateful. "I received my clubs today. They were well packaged and completely as described. I am very pleased." - Nick Hatton - Berkshire.